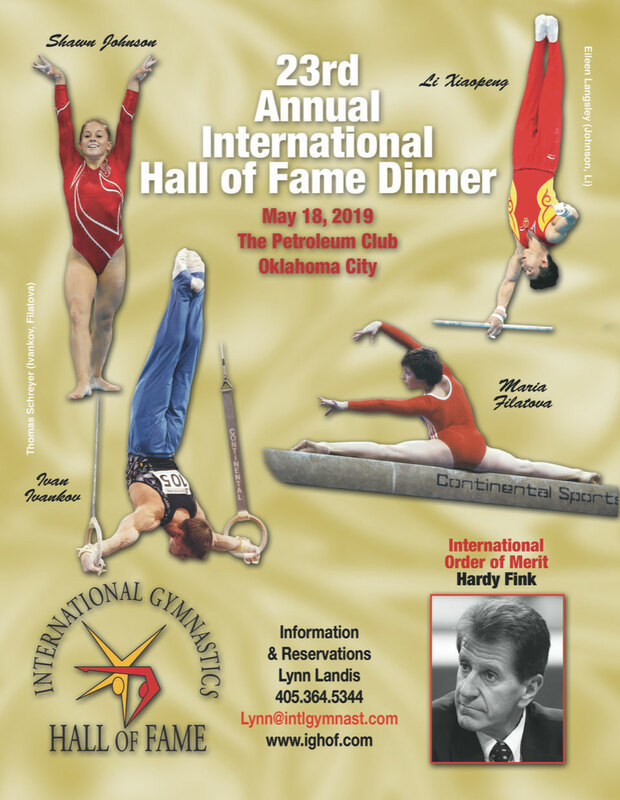 OKLAHOMA CITY – Five gymnastics legends will be honored at the 23rd annual International Gymnastics Hall of Fame (IGHOF) ceremony on Saturday, May 18, 2019, at the Petroleum Club in Oklahoma City. In addition to the Class of 2019 Inductees, the 2019 IGHOF International Order of Merit will be presented to Hardy Fink (Canada), the Director of Education & Academy Program﻿s for the International Gymnastics Federation, for his 4 decades of leadership and service. “The 2019 IGHOF honorees include some of the most famous, and influential, names in the history of our sport, so this year’s ceremony promises to be especially exciting and inspiring,” said Bart Conner, Chairman of the IGHOF board. Over the past 22 years, 99 of gymnastics greatest stars and contributors, representing 22 countries have been formally honored by the Hall of Fame. The IGHOF is home to gymnastics greats such as Vera Caslavska, Nadia Comaneci, Olga Korbut, Mary Lou Retton, Nikolai Andrianov, Sawao Kato and Vitaly Scherbo. Founded in 1987, the IGHOF was originally located in Oceanside, California. In 1996, it relocated to Oklahoma City, Oklahoma, where it has developed a solid foundation of private support. “The goal of the IGHOF board of directors is to preserve the legacies of these gymnastics icons and inspire future generations.” said Conner. For more information about the IGHOF and how you can be a member or donor, visit www.ighof.com. For tickets to the IGHOF dinner ceremony to be held on Saturday, May 18, at the Petroleum Club in Oklahoma City, contact Lynn Landis at 405-364-5344. For media requests, contact Allison Keiffer (Allison@intlgymnast.com) or call 405-364-5344. Endorsed by the Fédération Internationale de Gymnastique based in Lausanne, Switzerland, The International Gymnastics Hall of Fame is a dynamic, forward-looking non-profit organization that celebrates the athletic and artistic excellence of gymnastics’ most accomplished athletes and legends, and connects them with future generations of young gymnasts and fans.